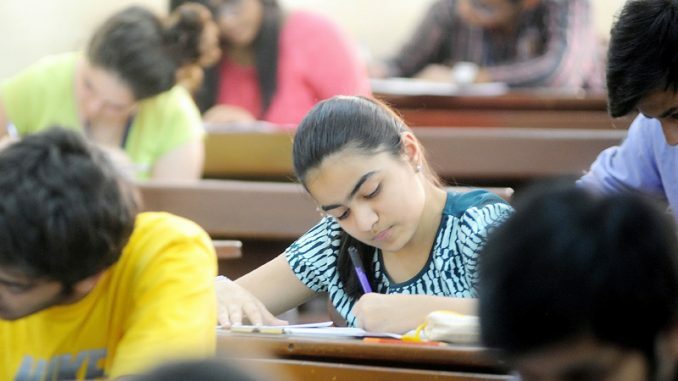 NEW DELHI: Gender gap in India’s institutes of higher studies has reduced by nine lakh in the last five years with girl students outnumbering men in eight disciplines in 2016-17 academic session, according to a survey of the HRD ministry. While in master’s of arts, there are 160 women for every 100 men, in bachelor’s of science (nursing) has 384 women for every 100 men. Even in the postgraduate classes of science and commerce, women have handsomely outnumbered men with 167 and 158 respectively per 100 males. However, in undergraduate and technical and professional courses like BTech, law or management, the enrolment is skewed in favour of males and the gap is significant. The All India Survey on Higher Education, released by the HRD ministry on Friday, says the gender gap in higher educational institutions decreased by over nine lakh from 2011-12 to 2016-17 (31.5 lakh to 21.5 lakh). The survey shows the Gender Partiy Index increased to 0.94 in 2016-17 from 0.86 in 2010-11 with women participation in certain disciplines very high and increasingly sharply in courses like MA, MSc, and MCom. The enrolment by the end of 2016-17 academic year stands at 3,57,05,905 with a Gross Enrolment Ratio (GER) of 25.2. GER is counted from the number of students enrolled in higher education institutions out of the total population in the age group of 18 to 23 years. Women continue to outnumber men in bachelor’s of arts and education. In MBBS there are 99 women per 100 male students, up from 86 in 2012-13, and in BCom up to 93 from 79 in the same period. At MSc level, mathematics, physics and zoology are subjects where the number of women is over 60% while in chemistry it is 56.3%. At postgraduate level, the highest number of enrolment has been for mathematics with a total of 1,43,762 students of which 62.1% are women. In social sciences and specially in courses like political science, 52.2% students are women. However, as per the survey, even though the GER of female is higher, there is still significant gap in BTech, MTech, law and MBA programmes. In BTech, there are only 39 women per 100 men, hardly any improvement from 38 women in 2012-13. 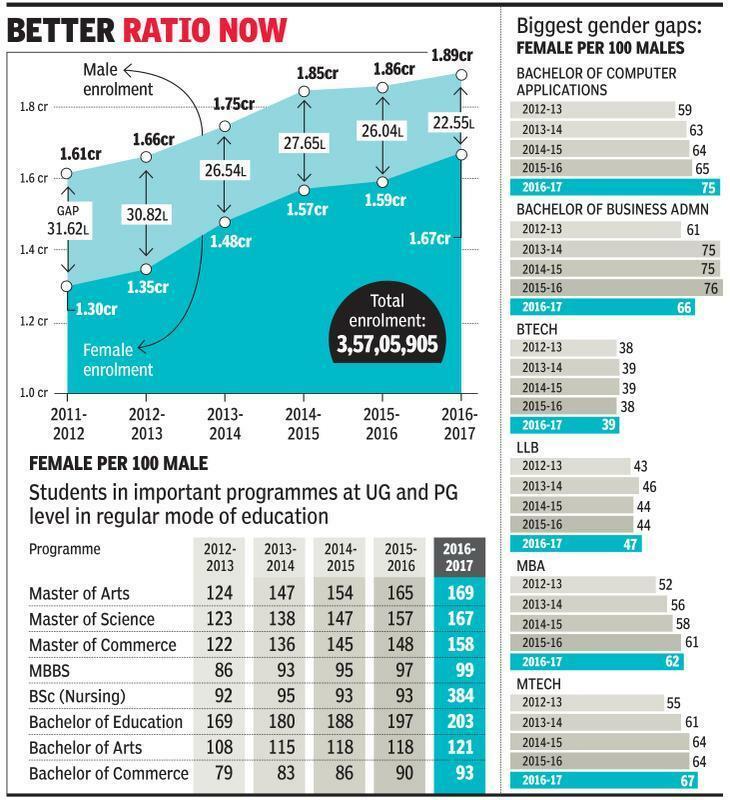 Barring MPhil and PG levels, the gap is also significant in diploma level courses with 70% male enrolment. India aims to attain a GER of 30% by 2020.